Remedies are incredibly important. Remedies are what clients want and understanding the law of remedies is crucial to both the study and the successful practice of law. Often remedies appear as afterthoughts to discussions about breach - whether of tort, contract or equitable obligation. This common approach can cost clients a lot of money. Vitally important too is an understanding of the significant overlap between remedies. Facts of the case can now be addressed from many different angles - for example, facts giving rise to a breach of contract may also give rise to actions in unjust enrichment and breach of the Competition and Consumer Act. Failure to appreciate different remedial consequences can cost clients hugely. 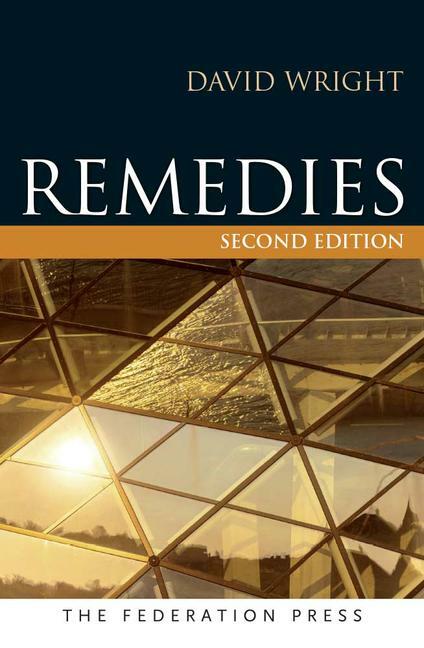 This work briefly sets out what the law of remedies in Australia actually is. By focusing on the Australian law, written in simple to understand language, accessible to all lawyers and law students, the book delivers what students and practitioners want and what their clients need. The new edition enhances all this by being up-to-date in this changing environment and by ending each chapter with a series of questions and answers, so that the law can be fully understood. David Wright was Associate Dean of Law (International), University of Adelaide Law School. Additionally, he has held the posts of Associate Dean of Law (Research) and Associate Dean of Law (Postgraduate), has been a Visiting Professor at the University of Tokyo and a Visiting Research Scholar at Kings' College London. He is a senior lecturer at the University of Adelaide and is admitted as a barrister in the Supreme Court of South Australia, the Supreme Court of the Northern Territory, the Supreme Court of Tasmania, the Federal Court and the High Court, as well as a solicitor in NSW.